Gaucho wrote: So if we lose two players per game, when will we run out of bodies? Wait 4?? Did I miss the others besides Neal? Orpik, Crosby, Neal, and Jokinen. Just guessing what they meant. But you have me. In hoc Rocco vinces. The U wrote: Refs allowed the Isles to run around for the last few minutes. This is what happens. Pierre mentioned the knee on Jokinen and the ensuing scrum were a result of how "well" the refs were doing. Unintentionally couldn't have been more correct. That's not what Peeair meant, he said that the calls they made were a sign of them doing a good job. But, they had easy calls to make in the last 4 minutes of Islanders taking runs at Cooke and Morrow. 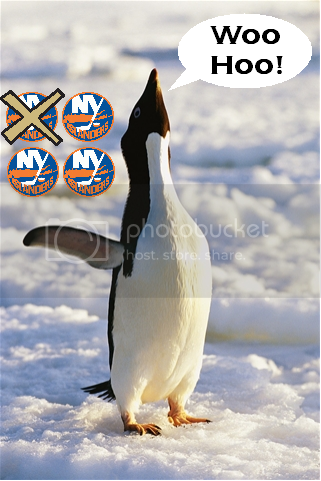 It was apparent that was what the Isles were doing, and the refs let it go until they succeeded in an injury. Should have put the Isles down a man earlier and controlled the game. The refs let it get out of hand. That is poor reffing. his ankle bent the wrong way after a clean hit into the boards. it looked pretty gnarly in the replays they showed in the post game show. It looked like JJ got a charley horse. I'm worried about Neal though, tough tough break. Read the bolded part again. You just echoed exactly what I was saying. Pierre said it was an indication of how "well" the refs were doing. I was saying that he meant they actually doing a good job, which they clearly weren't, but works the other way as well. In other words, I was saying that Pierre meant the scrum/cheap shot was a result of the refs performance, but not in the way he meant it. did Neal's ankle bend out or in? in is better and usually means low ankle. out is worse and usually high ankle. Last edited by sil on Wed May 01, 2013 9:31 pm, edited 1 time in total. Sorry I was on the road, finished our combo though! Great start to the playoffs though, minus the couple of guys going down. I think Juicy will be alright, but not so sure about Neal, that looked nasty unfortunately. Last edited by sharpshootr55 on Wed May 01, 2013 9:33 pm, edited 1 time in total. sil wrote: did Neal's ankle bend out or in? in is better and usually means low ankle. out is worse and usually high ankle. Oh god who let this yinzer ask questions in a hockey press conference. No injury update on Neal and Jokinen "and I won't be giving one." The old guy on the bottom left looks lost. Bylsma asked about Jussi and Neal injury update: I don't have one and I'm not going to give you one. AlexPKeaton wrote: Oh god who let this yinzer ask questions in a hockey press conference. One thing I'll say and this could be a good barometer of how this team feels and how focused they are...it can be tough to motivate a team after a big win or a big loss in a playoff series...Penguins coming off of a big win, I'm really hoping we come out guns ablazin' in the first 10 minutes at home in game 2. That sounds obvious and all, but that would make me feel really good about this team. My three stars... The French Canadians. lemieuxReturns wrote: My three stars... The French Canadians.